Fresh, foraged mushrooms are seasonal, and when you bring home a bounty, you don't want them to go to waste. That is where drying comes in. Dried mushrooms are a wonderful ingredient to add to a variety of dishes, including pasta, risotto, soups, and sauces. Oftentimes, however, they can be expensive or hard to find. Luckily, you can make them yourself in your own kitchen—perfect for when you have wild mushrooms from the farmers market. Most mushrooms dry beautifully. They even gain flavor from the process of drying. Dried mushrooms can be stored for at least a year and when you rehydrate them months later, their texture is almost identical to fresh mushrooms. Although the best way to dry mushrooms is in a dehydrator, you can get very good results using your home oven in just a few simple steps. All you need is a variety of mushrooms, an oven, a few baking sheets and jars, and you can preserve their flavor year-round. Mushrooms are often accompanied by a bit of dirt, and with all those nooks and crannies, there are several places for that dirt to hide. You need to make sure to clean them well before drying. It's a myth that mushrooms soak up lots of water, so don't be afraid to wash them thoroughly. While holding them under running cool water, clean the mushrooms well by scrubbing gently with a vegetable or mushroom brush as necessary. If you prefer, you can slice them first and then wash them. In order for the mushrooms to dry properly, they need to be in similar sized pieces. Slice the mushrooms 1/8- to 1/4-inch thick. Thicker slices will take longer to dry, which should be taken into consideration when using your oven instead of a dehydrator as you'll be occupying the appliance for several hours. You need to remove all of the water before putting in the oven. If the mushrooms are wet when put in the oven, they will essentially steam instead of dehydrating. Spread the sliced mushrooms on a clean dishtowel; loosely roll up the towel and squeeze gently to remove any surface moisture. Then arrange the mushrooms on a baking sheet, making sure that none of the pieces touch or overlap. You need a low oven for this method; preheat the oven to 150 F (65 C). Place the baking sheet with the mushrooms in the oven and leave for one hour. Turn the mushroom slices over and return to the oven for another hour. Take them out of the oven and let them cool before checking to see if they are crispy-dry. The cooling off period is essential because, like cookies coming out of the oven, they will crisp up considerably as they cool. If the mushrooms are not completely dry, turn them over again and return them to the oven for 30 more minutes. Keep turning them over and checking for dryness every half hour. Dried mushrooms keep well when stored in covered glass jars. Allow the dried mushrooms to cool completely before transferring them to the jars and cover tightly with lids. Label the jars as to the variety of mushroom and the date that you dried them. Store the jars away from direct light or heat and be sure to use them within a year. 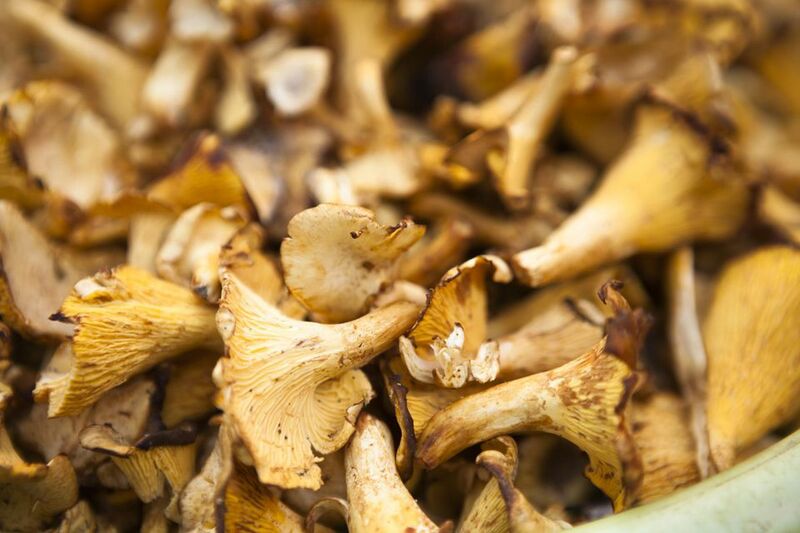 To use dehydrated mushrooms, place in a heat-proof bowl and cover with boiling water. Let them soak for 20 to 30 minutes. Drain and use the rehydrated mushrooms as you would fresh mushrooms. Save the soaking liquid as it will give a rich flavor to soup stocks and sauces.